BRUSSELS (AP) — The European Union’s top diplomat called Tuesday on Kosovo to lift tariffs on goods from Serbia and Bosnia-Herzegovina as the former Serbian territory faced pushback from longtime allies such as the EU and NATO along with familiar hostilities with Serbia. Kosovo last month slapped a 100-percent tax on Serbian imports, apparently in retaliation after its bid to join the international police organization, Interpol, failed amid intense Serb lobbying. EU foreign policy chief Federica Mogherini said that “it is in the interest of Kosovo to immediately revoke this decision.” She urged Pristina to settle its grievances through dialogue. Kosovo broke away from Serbia in 2008 and unilaterally declared independence. Belgrade doesn’t recognize the move, nor do a small group of EU states, like Spain for example that fear that recognition might fuel breakaway tendencies in their own countries. Mogherini’s appeal came as Kosovo’s prime minister accused her of mishandling EU-backed talks on normalizing ties with Serbia. He said that while Serbia is taking major steps toward the EU integration, Kosovo residents remain “in a ghetto,” not enjoying visa-free travel to EU countries even though it claims to have fulfilled the requirements. A news conference planned between Mogherini and Haradinaj in Brussels on Monday was cancelled without reason. 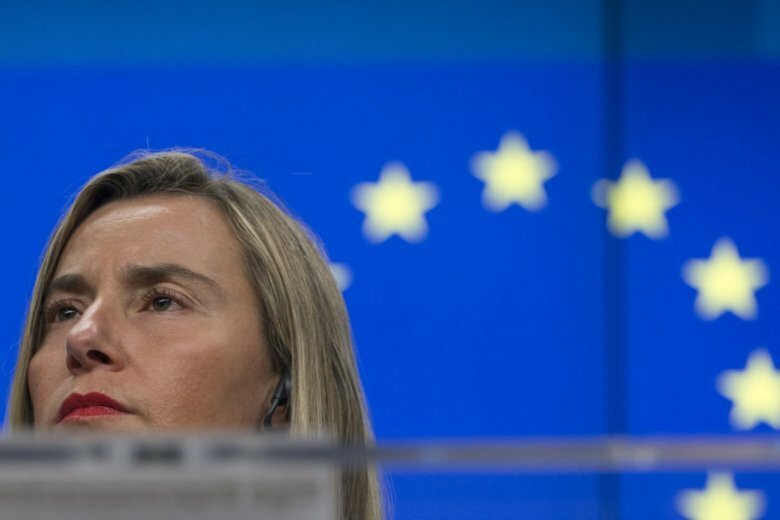 Mogherini said Tuesday it was because “we didn’t have any news to give,” and she noted that Haradinaj didn’t raise her handling of the talks with her. Haradinaj has said his government will only lift the tariffs once Serbia recognizes Kosovo’s independence. “It is absurd to ask Kosovo to lift the only product it has for the dialogue (with Serbia),” he said at a news conference Tuesday in Pristina. “We cannot accept only to be loaded with tasks and our people remain isolated in a ghetto,” he added. NATO ambassadors, meanwhile, were weighing Tuesday Kosovo’s decision to transform its security force into an army. Belgrade has warned that creating an army in a place it considers Serbian territory could result in an armed intervention. NATO and the EU have criticized the move, and NATO could reduce cooperation with Kosovo security services, although it seems unlikely to cut the number of troops in its own security force there, KFOR. “There is a long-standing agreement that NATO will have to re-examine our level of engagement with the Kosovo Security Force, should its mandate evolve,” spokeswoman Oana Lungescu said in a statement. “I look forward to hosting you and President Aleksander Vucic at the White House to celebrate,” Trump wrote.